The Linsly School Board of Trustees and Administration confirms its commitment and strategic focus to enhance teaching and learning, character and skill development, and provide meaningful experiences that will prepare students for success in college and life. Because of the ever-changing global environment, Linsly will continue to refine and improve its curriculum. In addition, Linsly will develop signature programs inspired by the needs of the next generation of learners. We will refine and revise Linsly’s challenging college preparatory curriculum to ensure that each student gains mastery of academic skills and personal character traits to excel as a leader. Through careful mapping and coordination, the Integrated School Curriculum will be aligned to develop key academic skills and character traits at every grade level and in every course. Linsly is committed to retaining and hiring teachers who utilize varied instructional methods and create an environment where students are active participants in the learning process. Linsly teachers regularly engage in research of educational methods and professional development. Linsly will continue to provide bright, motivated students with opportunities to enroll in intellectually-challenging courses that prepare them to be successful at the college level. Linsly students who excel are provided opportunities to enroll in Advanced Placement (AP) classes approved by the College Board. Linsly will regularly evaluate the curriculum and advanced course offerings. In addition, Linsly will promote and provide professional development opportunities for all teachers. Linsly teachers will continue to provide academic support to students who may need extra assistance. Linsly teachers will also strive to empower students to seek out extra help. Linsly will refine and annually evaluate the Aviator Lab, Transition to American Language and Culture class, and Peer Tutoring Program - programs designed to offer academic support above and beyond what a teacher can provide. We will enhance our Character Development Curriculum by confirming the character traits that comprise a Linsly education—integrity, respect, responsibility, perseverance, courage, citizenship—and by implementing a formal curriculum that inculcates those traits at each grade level. We will design, offer, and annually assess a Leadership Seminar Program, starting with ninth grade, which sequences students through proficiencies in leadership areas such as time management, study techniques and wellness, and civic leadership skills. Students will create a formal electronic leadership portfolio to track progress, which they can make available at the time of college application. We will implement a program as part of the Leadership Seminar Class that requires Upper School students to create and lead a community service project during their Linsly experience. Leadership Seminar teachers will help students develop and carry out meaningful and successful projects. Students will also be encouraged to engage in community service projects every year while at Linsly. Linsly has a rich and proud history of developing leaders. In that tradition, Linsly can enhance leadership opportunities using the Middle School Leadership Council, the House System, and Jr. and Sr. Prefect System to provide students with experiences that hone their skills while enhancing school spirit, celebrating diversity, and building community. We will enhance our academic program by emphasizing – communication, collaboration, critical thinking, creativity, technological literacy, inquiry, and leadership. We will design and implement a formal curriculum that instills those skills at each grade level through content and experiences that are age-appropriate. We will offer support and instruction for students who are non-native English speakers. We will focus on providing experiences that improve English proficiency and aid in the adjustment to Linsly and our academic program. Learning support programs will help students with diagnosed learning differences who are high-functioning and college bound. Students admitted into the learning support programs will go through an additional application process and have a full psycho-educational evaluation prior to enrolling. Reevaluations will be done to ensure Linsly is continually familiar with the student’s specific educational needs. Linsly can tailor specific academic plans that outline steps required for graduation. The student experience is enriched when the learning environment reaches beyond the classroom walls. During the middle school years, students will travel to various regions to deepen learning and to explore connections with classroom learning objectives. During the upper school years, optional travel experiences will be offered to provide experiences in service, and/or cultural and language immersion. Trips will be organized by Linsly teachers but will be offered through outside travel organizations. Linsly will strive to increase need-based financial aid to offset travel expenses for students who could not normally participate in these opportunities. Every student should be engaged after school in meaningful and enriching activities. In addition to athletics, Linsly will provide enrichment opportunities in art, music, dance, drama, forensics, and community service. The co-curricular program at Linsly is intended to help develop well-rounded students and to expose them to a variety of experiences. Middle School students are encouraged to explore different areas of interest. 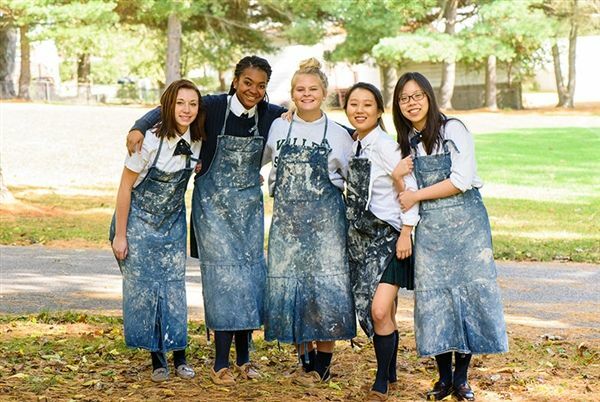 Upper School students are required to have at least one “formal” experience in athletics, community service, the arts, and independent learning. In addition, students will be required to complete two consecutive seasons of one co-curricular before their senior year. Linsly will consider offering summer residential programs. In addition, Linsly will offer summer courses for students wishing to pursue unique learning opportunities. Summer courses will allow students to take experiential elective courses not able to be offered during the school year. Linsly will strive to collaborate with local organizations to design a signature dance program. Students who enroll at Linsly will be given the added advantage of practicing and training on campus and learning from high quality dance instructors. Linsly will enhance music opportunities for students in unique and exciting ways. Our intention is to seek funding and support to develop a distinctive and signature music program. Linsly will strive to retain high-quality coaches, provide developmentally appropriate opportunities for students of all abilities, field competitive varsity teams, and hold students to high standards of honor, proper conduct, and sportsmanship. Linsly is committed to the tradition of producing a high-quality performance showcase of music, dance, and specialty performances. All students are required to participate in the annual Linsly Extravaganza each year. Students will also have opportunities to participate in art, music, drama, or dance programs during their Linsly career. Academic skills and character traits developed at Linsly will be predominantly assessed using performance-based assessments (i.e., that is, active demonstration of knowledge mastery, and skills acquisition). Character traits will also be assessed using a Linsly Character Performance Rubric, created by Linsly students and teachers. Linsly will showcase student work to display important work they have completed during the learning process. Through guided instruction in Leadership Seminar courses, Linsly students will be responsible for creating personal portfolios to showcase their best learning performances, co-curricular experiences, and unique passions and interests. College Guidance at Linsly will occur during a four-year class during grades 9-12. This class may be combined with the Leadership Seminar class, along with leadership instruction and college counseling. Each year the teacher will introduce age appropriate topics related to college preparation, such as standardized test prep, Naviance, career exploration, essay writing, interviewing, and researching colleges. By the time juniors complete the curriculum they will have a firm understanding of their personal goals and the expectations required to complete the college application process. During 12th grade, Linsly students will complete their college applications and focus on senior research. Linsly students will be encouraged to complete a career exploration internship during the summer of their sophomore or junior year. Internships will often be one or two weeks, but will sometimes result in longer term experiences. Students may work with their Leadership Seminar teacher to explore options and make arrangements with a mentor. The Linsly Alumni & Development Office will work closely with alumni and students to make connections and help students. Students who complete a Career Exploration Internship experience will be asked to include a summary of their experience in their personal portfolio and share them with their classmates and peers.